This episode is jaaaaam packed with value. 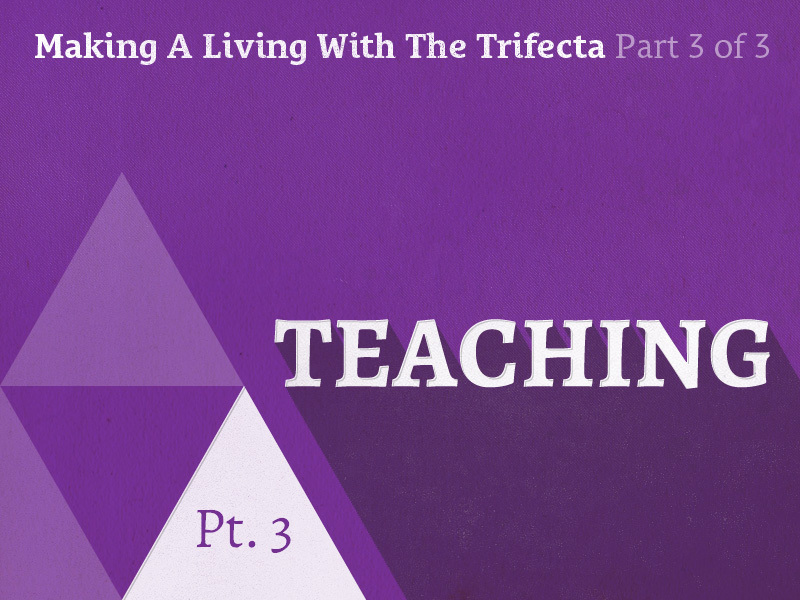 In an EPIC finale to the 3-part series on Making A Living With The Trifecta, I break down 8 methods of teaching and conflate both short term and long term monetization strategies (hint: The Long Game Mindset always wins). Don’t think you have anything to teach? This episode is for you. Have a lot to teach and don’t know where to begin? This episode is for you. Already teaching and want ideas for new ways to teach and make money long term? This episode is for you. I guarantee you’ll be reeling with ideas for days after listening to this one. You don’t have to have an audience to teach nor do you have to be an expert. You’ll grow your audience and be seen as an expert BY teaching. 01:51 Why I love to teach. 02:39 I didn’t always love to teach—I bought into the “Those who can, do; those who can’t, teach” idiom. 03:46 Teaching while you DO is a great way to go about teaching, because you’re right in the thick of what you’re teaching. 04:02 Someone who has been in business for 30 years and has run dozens of businesses may not be the best person to ask for advice on some of the struggles of getting started with your first business. 04:14 You may not be as popular as the other guy, but the recency of your experience might allow you to better relate with people that are just a few notches beneath you. 05:40 The 30-year business guy is pretty far removed from starting a business, which means he has to rely solely on principles. If you’re a newer teacher, you can take advantage of the fact that you have more current and tangible experience that can help someone just beneath you. I love teaching because it’s a way to multiply my knowledge or ideas. 08:07 Teach in the way that is most natural to you and then dissect what you’ve put out there. Break it down into steps, assess what you have, then revise it, put it back together, and recreate it based on the outline that you have. 10:33 You don’t have to be an expert to teach—you’ll be seen as an expert because you teach. Teaching doesn’t have to be Step 3, but in terms of making a living, it tends to best fit in that order. 11:06 In theory, you’ve been working with clients, you’re putting out products, so you’ve got a pretty solid handle on your skills and your process. This experience is something you can pull from when teaching and gives you insights to share with others. 11:52 Even if you teach nobody, you’re still learning more yourself. 12:27 Now, you maybe have started growing an audience by now with your client work, and case studies, and various products. But if you don’t have a large audience yet, don’t worry. That’s where the teaching comes in. The teaching is how you establish yourself as an expert, the teaching is how you grow an audience. 12:40 We talked about this in e067: You don’t have to have an audience to teach, and you don’t have to be an expert to teach (Related: e067 Why You Shouldn’t Wait to Start Teaching What You Know). You’ll grow your audience by teaching and you’ll be seen as an expert by teaching. 14:02 Very much so yes. The point is to stop focusing on how many people are learning from your teaching. Instead focus on the value of teaching to yourself. Even if there are 0 people in your classroom, you should still be teaching to better your own teaching skills. This means that when people do show up, when you do have an audience, your teaching will be even better. 14:42 Now, I don’t think that means that you should go trying to sell or monetize these types of teaching before you have an audience. You should start teaching wherever you’re at. But that doesn’t mean that if you have no audience you should spend the next 3 months building some product to sell. You have to have an audience first. 15:15 Don’t try to sell your teaching too soon. 17:43 Differentiating long term monetization and short term monetization (i.e. The Long Game Mindset). 18:06 I’m about to list off a variety of ways you can teach, and with just about every single one of them, there are ways to immediately monetize them. You can squeeze out the potential profit from every single one of these, but it’s worth thinking longer term. Before you squeeze out the immediate profits from your efforts, think about what’s best for your long term success. As you teach, you will find more to teach. 19:29 We’re 82 episodes in on this podcast. I’ve said it plenty of times before, but it bears repeating here: I did not have 80 episodes of content when I started out podcasting. I started with a commitment to show up regularly, and the motivation came. The content came, the teaching came. 19:46 Everything you have to say now isn’t everything you’ll ever have to say. You can and will always come up with more. 20:11 Can you do ads? Yes. I’m not going to tell you that you shouldn’t, but I personally don’t like the idea of ads or sponsors, because it cheapens the brand. You also have to have a ton of exposure and page views to be able to make any kind of living from the ad revenue, otherwise it’s pennies. And yes, my monthly pageviews are in the mid 6 figures, but it’s still not something that’s worth it to me. I’d rather use blogging as a catalyst and monetize it other ways. Simply teach without selling at all, but have other paid products on your site (good blog posts drive traffic to your site and some of those people will discover your products that way). An introductory step in your sales funnel. A way to get people onto your newsletter. 22:15 Don’t go after quick exposure. Focus on building up a huge body of work and a huge catalogue of content that someone a year, 2 years, or 3 years from now will stumble across and say, “Oh man, this is amazing.” You may not have that exposure now, but when people DO find it, the growth will be exponential because they’re going to share it like crazy. 22:51 Just like with this podcast: Our downloads have been doubling month-over month. In just the past month, this podcast has had as many downloads as it has in all of the months prior. 23:14 That’s not because I tried to “game” the iTunes system. I didn’t adopt these “launch strategies” for podcasts where you launch with several episodes, and try to get your followers to download a bunch at once or leave a ton of reviews to get up in the “New & Noteworthy” section. No. I focused on producing high quality content, very consistently, and very regularly over a long period of time. Yes, that’s the slow way, but in the grand scheme of things, 10 months is really no time at all. 23:59 We’ve built up this huge catalogue so that when people come across it, they’re like “Ho-ly crap. Oh my gosh.” Every day now, people are tweeting “How have I not heard of this? Go check this out!” That’s because it’s a wealth of knowledge. Talk about your client work (case studies, the problems you solved, etc.). Talk about client work itself on a philosophical level (e.g. professionalism). If you don’t know anything, interview people that know more than you do. Don’t focus on celebrities and trying to get traffic. Just find someone that’s a little bit ahead of you and ask them some good questions. Share insights on the tools you use—write a blog post on each of your top 10 tools. 28:41 The newsletter does need to be valuable. The ideal use of it is teaching. Provide more value. Every email needs to provide value. 29:18 Provide more value: that is what the newsletter is about. Long Game. 29:24 Short term monetization would say to have a paid newsletter. I’d recommend instead thinking of it as a more long term strategy instead of immediately monetizing. 30:53 Find ways to leverage the exclusivity of the newsletter. If you’re only providing things that could otherwise be found on your blog, it’s not as valuable. 31:37 Provide more value. Teaching, teaching, teaching. Get people to associate your name with valuable content and insights. Then promote your paid products. You’ve got people opening all of your emails because they know it’s going to be good. When you’ve given a lot, people will be compelled to return the favor. 32:35 I personally prefer to see a newsletter as a tool to provide value and promote paid products for more as opposed to something that is a paid subscription itself. 33:24 Great for teaching things that lend themselves better to being shown visually, and great for instilling personality. 34:13 Videos are a great way to discover what really resonated with people. 34:48 Discover what is valuable to people by evaluating the engagement form the videos you share and allow the feedback to shape the courses you make. 35:15 Short term monetization: Ads. 35:28 Ads cheapen. Ads cheapen. Ads cheapen. Your brand looks sucky when you have ads. It tarnishes the brand perception. Ask yourself: Is your brand perception really worth pennies to you? 36:05 Brand perception is what lets you sell higher priced products. You can charge more when you have really good brand perception. 37:26 If you’re teaching people how to do something that doesn’t make money to people that don’t have money, don’t be surprised when they don’t buy. it’s as simple as that. If you’re teaching something that does make money to people that don’t have money — it doesn’t work. If you’re teaching something that doesn’t make money to people that do have money — it doesn’t work. If you’re teaching something that doesn’t make money to people that don’t have money — it doesn’t work. If you’re teaching something that does make money to people that do have money — it works. 38:07 You are not a Fortune 500 company: you cannot afford to go after volume. You have to go where the money is. 38:38 Shoot for 10x value. If your course is $500, ask yourself if someone will be able to take and apply the knowledge that you’re imparting to create $5,000 worth of value from it. Start with the end goal in mind. What is the takeaway? Establish this before building your course. Let the value proposition you make up front serve as a promise to the customer and an ending point for yourself. 40:35 If you describe the problem that your customer has better than anyone else, they will assume that you have the best solution. 40:44 Do not describe what you want to make. Describe what the value is to the customer. That’s how you’re going to grow your audience. 42:05 Set your product apart as a problem-solving product, not a nice-to-have product. Investment vs. expense. 43:31 Give away the best 10% of your course for free. 45:09 Upselling to higher tier courses. 47:26 People do not tune into podcasts to listen to sponsors. They mash the 15-second forward button. 48:12 Stop trying to immediately monetize every single thing that you do. Adopt a Long Game Mindset. See everything as an investment. 51:00 The less-direct benefit of podcasting is getting people to buy your products. 51:45 Ask yourself: If I don’t do podcast sponsors, could the increase in quality of my show positively impact the growth of my audience and the boost in my exposure such that it has an effect on the amount of products I sell, or how soon I get to do something like speaking. 52:35 Yes. Just like with our golden episode (Related: e024 Finding Clients While Maintaining Professionalism), you don’t go chasing after clients because they’re going to be the wrong type of clients. 52:55 It’s the same with speaking. You want people to come to you because they value your insight and because they value your wisdom, your teaching style, the way you convey things, etc. You want that, because those are the kind of people who will compensate you for your value. 54:36 If you can draw an audience, you can demand certain rates. If people buy tickets when they find out you’re going to speak somewhere, that is draw. 55:03 What is the value of your time to you? Someone may be willing to pay you $1,000 or $5,000 to speak, but if your time is worth more to you than that right now, maybe you shouldn’t do it. 55:49 You can’t just take on a client because they have the money. If it’s the wrong time, if they’re not on board with your process, if it’s not a client you want to work with, if you have family things, if you need a break, if you’re burnt out… you need to think about all this stuff. 57:04 How to get paid to speak without ever having to take on free speaking gigs. 59:18 Consulting is a great way to make money teaching. Obviously, the easiest way to make money consulting is to charge for it. 59:51 If you’re thinking about whether or not to charge, say, $250/hr, ask yourself if your client is going to be able to realize $250 or more in profit from applying the knowledge you imparted during the consultation. If so, don’t even hesitate to set your rate accordingly. 1:00:28 Giving away some consulting time for free can end up creating revenue in other ways. 1:04:10 The content for a book comes from a commitment to showing up with all of these other things. When you commit to doing a weekly podcast, or a daily blog, or a biweekly newsletter or regular YouTube video, you will find that you have increasingly more to say. As you show up, you find more things to say. 1:04:31 You can revisit your backlog of content and repurpose or repackage it as a book. 1:06:09 Book-writing is probably the most difficult thing you will do in your life. 1:06:31 Obviously, selling a book is the easier way to monetize book-writing. But with my book, The Overlap Technique, I’m giving the book away. It’s all about that long game mindset. I’m planning to offer more value above and beyond the book, and the book itself is a way to attract people. By giving something so extremely valuable away for free, I increase my audience and thereby increase the number of people that will buy my higher tier offerings.